Until 1488, Europe was only familiar with the northern part of the African continent. Today’s Morocco, Libya, Algeria and Western Sahara had come in contact with the Italian and Greek empires due to their proximity to those kingdoms. The Saharan landscape hadn’t allowed the Europeans to venture south of the African continent until one event changed the course of history. Constantinople the city established by the Roman King Constantine the Great, fell to the Ottoman Turks in 1453. With the fall of Constantinople, Europe lost the only link it had established with the East. The Turks did not allow European trade to continue. Wealthy Europeans had now grown fond of Indian spices and silk. China provided paper and Gold. With spices the shelf life of food prepared was increased leading to lesser deaths from hunger. With the complete stoppage of trade, it increasingly became difficult for Kings to rule in peace. The might of Rome had by now become history. The Spanish, Dutch and the Portuguese Kings combined could not take on the army of the Ottoman Empire and thus history presented an opportunity to the new world. It was now clear that the new route should be found through the seas. But who would do it? Nobody in Europe dared to cross the seas. The Kings announced generous grants in Gold and Silver to whoever comes forward to take the opportunity. One man from Lisbon was up for the challenge because he needed money. It was in 1487, assured with generous grants from the Portuguese King John II, Bartolomeu Dias set sail on a journey to find a sea route to the East. After a year losing more than half his men he reached the Southern tip of Africa, not knowing what it is. He couldn't go any further due to his depleted resources. Seeing the calmness of the sea and hoping that the way further will take the next sailor to the East, he called it the Cape of Good Hope. 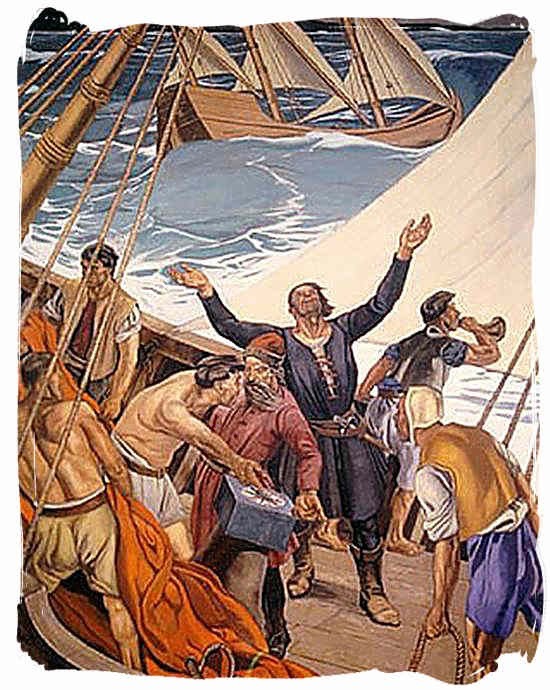 Bartolomeu Dias could not continue his journey. But the next sailor who reached the Cape did it in 1497. The Portuguese emperor announced a prize of 100,000 gold coins to the man who would find a sea route to the East. Vasco da Gama accepted the challenge and set sail. He reached the Cape of Good Hope which in turn turned out to be lucky for him. After reaching the cape he set sail along the eastern coast of Africa and reached today’s Ethiopia where he met the Mohammedans of Calicut who had gone on their annual pilgrimage to the Haj, in Saudi Arabia. With their help Columbus reached India and became part of history. Some books mention that he killed all the pilgrims who had helped him reach India to maintain that he found the sea route independently. He was a "son of a gun", as one of my history teachers put it. What history does not tell us clearly is that this event set the precedence of trade through Africa. As a result the fertile and rich Southern, Western and Eastern Africa came under the influence of the west. What followed in the later centuries were bloodshed, battle and colonisation and loot. The native tribes who lived in oblivion were massacred and subjugated by the Westerners. Africa's vast mineral and natural wealth, the untouched beauty of the landscape became a source of contention thus plunging the continent to an era of darkness. I was recently part of an event where IIFT hosted a pre-independence day dinner to all the high commissioners of African embassies located in Delhi. As we celebrated our 68th Independence day, my mind rushed through the old history pages of school.